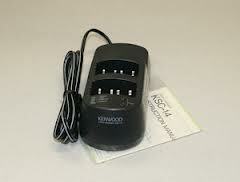 Home > Commercial-Land Mobile-Marine > KENWOOD > Chargers > KSC-14 : Desktop Rapid Charger for KENWOOD PB-6, 7, 8, 32, 33, 34, 36, 37, KNB-11, 12 etc. KSC-14 : Kenwood-brand Desktop Rapid-Smart charger for KENWOOD-type battery packs such as PB-6, 7, 8; PB-32, 33, 34; PB-36, 37; KNB-11, 12 etc. Charges 6-volt thru 12-volt batteries. Has LED status indicators and auto shut-off. Plugs directly into 110-120VAC wall outlets. LIMITED QUANTITY - NEW IN FACTORY BOXES.